is that Lake County is a healthy place for every person to live, learn, engage and thrive. 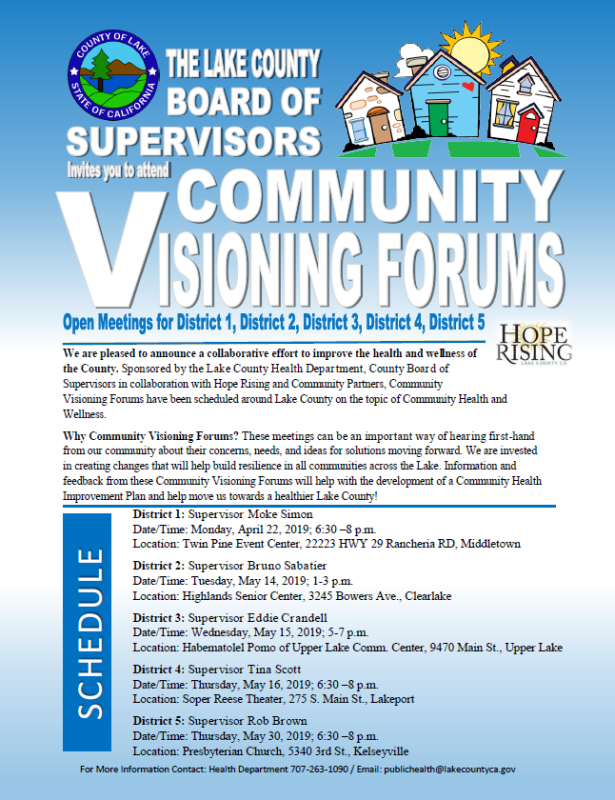 of Hope Rising Lake County is to mobilize and inspire community partnerships and actions that support individual, collective and community health and wellness. for health systems, county leaders, non-profit organizations and other relevant organizations of Lake County lead a joint effort, leveraging their resources and influence to improve the overall health and wellness of Lake County. When was Hope Rising Established? Hope Rising was established in the year, 2015. Do you have any active projects in the community right now? Currently there are two major projects functioning under Hope Rising including, SafeRx Lake County Opioid Misuse Prevention Coalition and Project Restoration a program designed to assist high utilizers living in the community. What is a High Utilizer? High utilizers can best be defined as a person living in inadequate housing or without a home and is in need of assistance to organize their priority needs. Who are all the partnering organizations? What is the Mission of Hope Rising? Our mission for Hope Rising Lake County is to mobilize and inspire community partnerships and actions that support individual, collective and community health and wellness. Is there a centralized location for HR? As Hope Rising serves as a community collaboration, there is no one single location. Meeting locations are rotated between Lakeport and Clearlake monthly. Can community members participate in HR? We have not yet reached a point where we are requesting community input. All ideas and suggestions for this Accountable Community for Health can be submitted through the CONNECT page. If you are interested in volunteering with SafeRx Lake County the opioid misuse prevention coalition please contact the program coordinator, Susan DeSalvo-Reed at desalvsa@ah.org. What is an Accountable Community for Health (ACH)? Shared Vision and Goals – The primary mission of an ACH Collaborative is for a range of organizations, stakeholders, and residents to come together around a common set of goals. A shared vision, based on an agreed-upon understanding of the nature of the health problem, is a critical first step to ensure that all participants have a clear understanding of the purpose and expectations of the ACH Collaborative and to promote collective accountability for achieving its goals. Equity and resident engagement are central to the values of an ACH.